Summer Fridays have been great for some much needed relaxation time, but also for new beauty discoveries. Who doesn’t like to do a little shopping on their day off? These four new products I picked up this past month are the equivalent to my June beauty favorites because I’m just not able to pick out which product I like most out of the bunch. They’re all so good! I thought I’d put a little post together to share these tidbits with you all in the hopes that you might find something you like just as much. Recently, I stopped in Sephora while the Benefit beauty advisors were introducing shoppers to the new brow collection and holy crap there are SO MANY new brow products. One of the lovely Benefit ladies filled in my brows with the new Goof Proof Brow Pencil and yeah, I was sold. She filled them in thicker than I normally do, but I was definitely a fan of the finished results. If brows are your thing, I highly recommend checking out all of the new Benefit goodies. Other items I picked up include a gorgeous bronze eyeshadow duo, the easiest contour product ever and a great summer CC cream that really is your skin but better. I think what sold me on this eyebrow pencil right away is its unique teardrop tip that easily shapes, defines and fills in your brows. I don’t know of any other eyebrow pencil with that particular shape, which is what makes this one really unique. I found the color to glide on naturally and it lasted on my brows all day. I’ve been using the pointed tip to outline my arches and define the rest of my brow with the wide base. 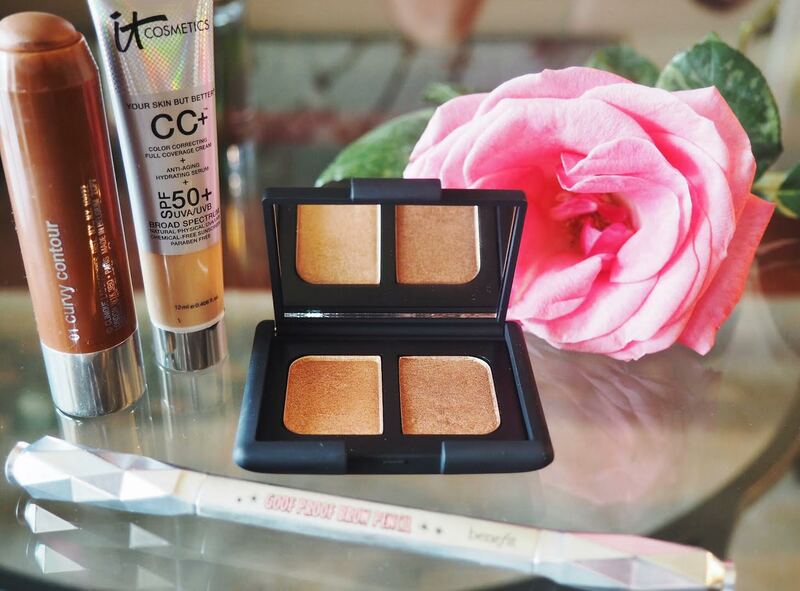 This product is ideal for anyone who wants to give contouring a try, but doesn’t want to start off with something like the Anastasia Beverly Hills Contour Kit or Kat Von D Shade + Light Contour Palette mainly because they’re both a bit of a splurge. Personally, I’ve always been perfectly happy with bronzing up my face normally, but recently I’ve been contouring on days when I have something more exciting going on as opposed to just an average day. Glide the Clinique Chubby Stick over your bare skin after foundation to the hollow of your cheekbones, jawline, upper forehead and other areas as you wish. Easy peasy. One of my favorite beauty bloggers, ViviannaDoesMakeup, raves about this stuff. I usually stick to using my beloved Bare Minerals Complexion Rescue Tinted Hydrating Gel Cream in the summer, but I wanted to find another product that I could love wearing just as much. It’s good to switch things up every now and then. I bought the travel size version to see how I’d get on with it first. Yup, I’ll be going back to Ulta for the regular size as soon as this one runs out. I love that you can build up the coverage pretty full, but also pop on a bit on a day when you’re not feeling like wearing any makeup. This cream makes my skin look ridiculously healthy and glowy, which compliments the bronze eyeshadow looks I’ve been loving lately. If you have oily skin, I’m not too sure if this would be right for you because I find it’s better for dry/dehydrated skin. What more can I say about two colors that are perfect for all of the bronzed makeup looks you could ever imagine? I may have worn this duo everyday for the past week or so. Maybe I’m overdoing it? Nah. I like to wear the shimmering copper shade all over my lid and then smudge the frosted ginger shade underneath my eye with a pencil brush. If you’re feeling up for it, finish the look off with some false lashes. So so pretty.